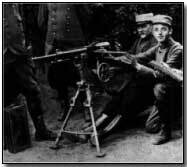 The St. Etienne 8mm heavy machine gun was the product of a French government design and produced at the St. Etienne arsenal - hence its name. Designed as an improvement upon an earlier failed 1905 Puteaux weapon, and based upon the Hotchkiss, the 1907 30-shot St. Etienne was considered unreliable by the French army. It was theoretically capable of firing 500 rounds per minute, although far fewer in practice. Weighing almost 26kg and inexpensive to manufacture (using inferior materials) the St Etienne proved prone to overheating. It would probably not have been deployed at all during the First World War but for the shortage problems affecting manufacture of the widely used Hotchkiss gun. The St. Etienne was eventually entirely withdrawn from service in 1916, deemed a complete failure.